The Liquid Volume Dispenser will deliver a measured volume of liquid at the press of a button. The operator selects a volume, presses a button and the Liquid Volume Dispenser delivers the required volume without further operator intervention. The Liquid Volume Dispenser dispenses volumes between 0.10 litres and 100.00 litres (standard version) or 0.025 litres and 10 litres (low volume version) and can be incremented in steps of 0.01 litres (standard version) or .001 litres (low volume version). 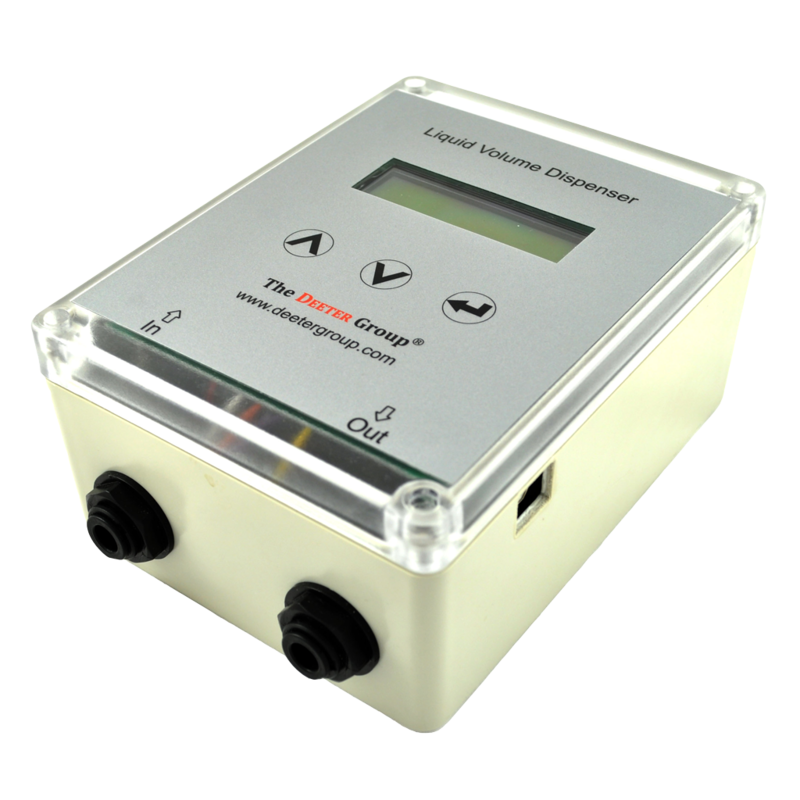 The Dispenser accurately measures volumes over a flow rate range of between 0.6 and 5 litres/minute (standard version) or 0.2 and 2.5 litres/minute (low volume version). The Liquid Volume Dispenser has two John Guest Speedfit® push-fit connectors for fluid in and out. These take a tube with outside diameter of 8mm. Wetted surfaces are nylon, PTFE, Buna and acetal, making the Liquid Volume Dispenser suitable for a wide range of fluids. Operator controls consist of a three-button keypad and a liquid crystal display. The display shows the selected volume and progress during dispensing. A number of additional features are available through the keypad, including pause and restart during dispensing, cancelling dispensing, and manual ‘top-up’ control. An audio ‘beep’ options is provided to indicate when dispensing has stopped. Another audio option will produce ‘beeps’ if the flow rate is outside the limits for accurate volume measurement. These audio options can be enabled or disabled through a display menu and are save to non-volatile memory, so are restored to the operator’s preference after power-up. The Liquid Volume Dispenser is powered by a low-voltage supply, making it safe to use if liquid is spilt. A 12VDC mains socket adapter is supplied with each Dispenser. The Dispenser can be connected to a PC for remote control and monitoring and is supplied with an easy-to-use software application that repeats the operator controls and displayed information. Please Note: There must be a pressure differential between inlet and outlet for the liquid to flow. This version of the Liquid Volume Dispenser does not include a pump. Please click here to view the deeterflow® Automatic Liquid Dispenser, which includes an integrated pump.